“Super Bill” played quarterback, wide receiver, and safety in college, once intercepting four passes in a game against Texas A & M. He was chosen by the Eagles in the third round of the 1969 NFL draft and backed up at free safety, returning an interception 56 yards for a touchdown, while punting for a 39.8-yard average and returning kicks. Slated to move into the starting lineup in ’70, Bradley was sidetracked by a preseason knee injury and, when he returned after six weeks, he reinjured the knee and was only able to punt. He had surgery following the season and came into 1971 as the starting free safety. Eagles went 6-7-1 to finish third in the NFC East. Bradley held out along with LB Tim Rossovich during the 1972 preseason but went on to intercept 9 passes and become the first player to lead the NFL in interceptions in consecutive seasons. He was again a consensus first-team All-NFL selection and was chosen to the Pro Bowl. A ball hawk with great instincts and an aggressive defender, “Super Bill” had one more Pro Bowl year in ’73 when he added another four interceptions and was a second-team All-NFC selection by UPI in 1974. Injuries became a factor in ’75 and Bradley missed parts of the last four games, although he picked off another five passes. After one more year with the Eagles, he was traded to Minnesota in 1976, failed to make it to the regular season, and finished up with the St. Louis Cardinals in ’77. 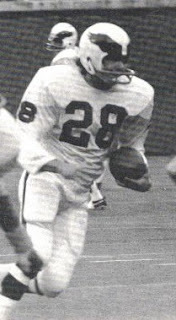 Overall, Bradley intercepted 34 passes, all with the Eagles, making him the franchise’s career leader (later tied by Eric Allen and Brian Dawkins). He also punted 213 times for a 39.0 average, returned 122 punts for a 7.8-yard average and 27 kickoffs for a 20.9 average. Bradley was twice a consensus first-team All-NFL selection and was chosen to three Pro Bowls.